Based on the refined ETABS Benchmark model of a 606m mega-tall building (provided by Prof. Xilin Lu and Prof. Huangjun Jiang from Tongji University (Lu et al., 2015a)), the corresponding models of OpenSees are established and provided here (Figure 1). 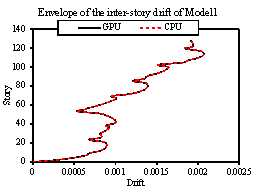 The modeling method proposed by Lu et al. (2015b) is adopted for this building. Two mesh schemes are considered, which results in two models: Model 1 and Model 2. Model 1 is relatively coarse, which has 27220 nodes. The coupling beams and shear walls of Model 1 is subdivided to generate Model 2, which has 81572 nodes. The shear walls and coupling beams are simulated using ShellMITC4 in OpenSees. There are some differences in defining the elastic modulus of concrete in ETABS and OpenSees, which will affect the calculated vibration periods. When we conduct the modal analysis, the elastic modulus of concrete material in OpenSees should be adjusted following the equation Ec=2fc/e0, where Ec is elastic modulus of concrete in ETABS. Through the adjustment, the vibration periods of OpenSees agree well with those of ETABS. Note that the commercial software package MSC.Marc has been widely used in nonlinear analyses of super-tall buildings and well validated. 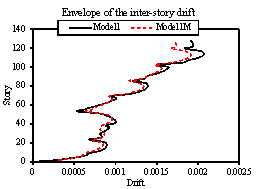 The corresponding models are also established in MSC.Marc (denoted as Model1M and Model2M, respectively). Through the comparison between the time history analysis results of OpenSees and MSC.Marc, the reliability of the OpenSees models is validated. The El-Centro ground motion, which is scaled to a value of PGA of 220 cm/s2 (i.e., the MCE level ground motion of this building according to the Chinese code), is firstly used to conduct the time history analysis of Model1 and Model1M. Note that both CPU and GPU solvers (Tian et al. 2015) are used to perform the time history analysis to validate the reliability and facilitate different researchers to use these models. If you want to use the CPU version model, please use ¡°dynamiccpu.tcl¡±, else please use ¡°dynamicgpu.tcl¡± in the zip files. 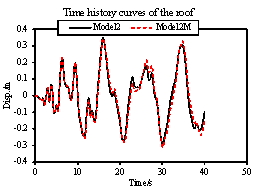 The time history curves of the roof and the envelope of inter-story drift are presented in Figure 2. Good agreements are observed. 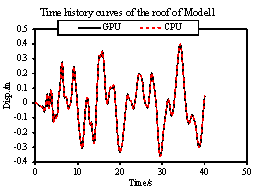 In addition, the time history results obtained from CPU and GPU are also compared in Figure 3. The results are identical, thus validating the reliability of the GPU solver. 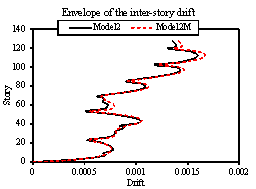 Then, the time history analysis of Model2 and Model2M are also performed. 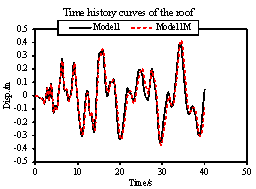 The time history curves of the roof and the envelope of inter-story drift are presented in Figure 4. Good agreements are also observed, thus validating the reliability of Model2. Note that we define several recorders. Among these, dispx.txt, dispy.txt and dispz.txt record the translational displacements of all nodes for post-process, which will consume considerable hardware memories, so please use it with caution. If you have any questions, please feel free to contact with Prof. Xinzheng Lu via: luxz@tsinghua.edu.cn. Lu XZ, Xie LL, Guan H, Huang YL, Lu X. A shear wall element for nonlinear seismic analysis of super-tall buildings using OpenSees. Finite Elements in Analysis and Design, 2015b, 98: 14-25. Tian Y, Xie LL, Xu Z, Lu XZ. GPU-powered high-performance computing for the analysis of large-scale structures based on OpenSees. Computing in Civil Engineering, 2015: 411-418.